Renowned Belgian Chocolatier GODIVA adheres to the Belgian spirit and dedicates quality skills and devoted love to every chocolate creation. 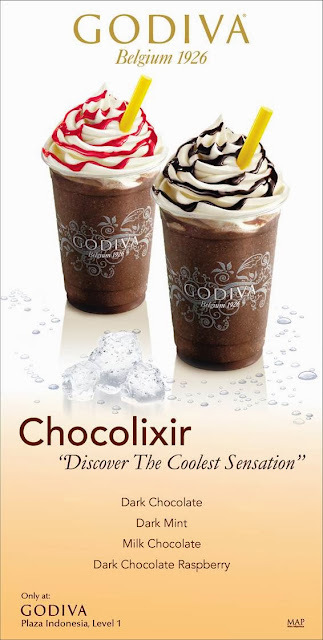 For Summer 2013, GODIVA is proud to present the CHOCOLIXIR Collection — to send your taste buds on a refreshing, icy journey! Iced Dark Chocolate, Iced Dark Chocolate Mint, Iced Dark Chocolate Raspberry, and Iced Milk Chocolate adding a sweet touch to the very popular Chocolixir Collection that is sure to send your taste buds on an icy journey! Fresh mint and dark chocolate makes the perfect combination, mixed with smoothing ice, you can experience the revitalizing effect with just a tiny bite of the GODIVA Iced Dark Chocolate Mint; it is definitely a delight for all mint chocolate lovers. While this smooth and velvety chocolixir melts in your mouth, the deliciously complex aroma lingers. Sending summer breeze in this hot weather, GODIVA Iced Dark Chocolate Raspberry Chocolixir combines the richest dark chocolate and refreshing raspberry jam in one icy drink. The perfect combination of GODIVA’s and raspberry delivers a smooth and sweet texture. With a vanilla cream swirling on top, the pleasure from the Chocolixir is instantly enhanced. You can almost feel the icy feeling penetrate through your body for every sip you take. You would not want to miss out on this treat this year! Created in 1926 in Brussels by Pierre Draps and further established by Pierre’s son Joseph Draps, GODIVA Chocolatier has become one of the most prestigious chocolate brands in the world. The recipes of our founder and our unique chocolate making process remain the secrets of GODIVA quality, leading to GODIVA’s appointment as official supplier to the Royal Court of Belgium. From our legendary chocolates and luxurious truffles, to our chocolate covered biscuits collection, coffees and chocolate drinks, GODIVA Chocolatier is dedicated to over 87 years of excellence and innovation in the Belgian chocolate making tradition, creating enticing experiences to complement any occasion.